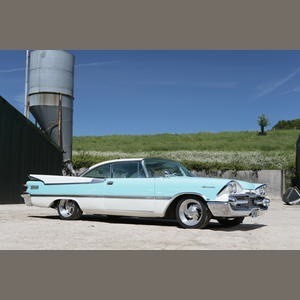 1959 Dodge Coronet Lancer. Hard top coupe. Tail fins & Cassata ice cream colours. CLASSIC MOTOR CAR AUCTION. Beaulieu Collectors Motor Cars & Automobilia. September 7th 2013. UK. Organised by Bonhams Auction House. Lot 309. 1959 Dodge Coronet Lancer. Hard top Coupe.Tail fins & cassata ice cream colours for this amazing “Rock Around the Clock & bobby sox” reminder. No Reserve. Beaulieu Sale Collectors Motor Cars & Automobilia. Organised by Bonhams 7 September 2013. Image Photo Simon Clay.